Highlights from the second round of the 2018 FIA Asia-Pacific Rally Championship in Canberra will air on Fox Sports this week, featuring crews from the CAMS Australian Rally Championship. 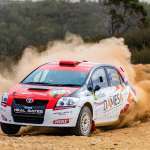 The rally was dominated by the local Australian Rally Championship crews, with Eli Evans and Ben Searcy claiming maximum points aboard their Skoda Fabia R5. A 30-minute highlights package will air on Fox Sports (506) at 6:30pm on Tuesday 16 October.